Last week I worked the TNSY booth at a seed swap sponsored by the Johnson City TN Parks Department. A woman presented me with an interesting question. She said she owns an abandoned farm field next to her house, and she wanted to know how to add native wildflowers without doing any removal of the existing grasses and weeds. It is an intriguing question and I am sure not an uncommon one. I told her to start out by purchasing a large quantity of seeds of aggressive plants that germinate easily from seed and can hold their own against existing weeds once they are up. I pointed out that there are quite a few that are $10 or less per ounce, and she could do it without spending lots of money. In a short time, she would know whether it was going to work. Otherwise she should look into purchasing plugs of aggressive plants. I have never tried to do this actual task although I have lots of experience with aggressive plant species and some experience with seeding over established plantings. I thought this is a perfect opportunity to use the TNSY native plant blog to collect feedback from people who have tried to do this and learn what works and what doesn’t. Maybe she will even see this blog and get a more complete answer to her question. In the meantime, it is a great chance for all of us to learn more. After thinking about the problem, I would expand my original suggestion as follows. First do a soil test and check soil type and moisture level in order to better match plants to the site. Second, mow the field area in fall, if you can, and broadcast the seed in early December. Third, think about how much seed you want to use per foot. Do at least the recommended rate for your site which is probably at least 100 seeds per square foot. You may want to even double the recommended rate. My hypothetical list would give you almost half a million seeds for $103. I used current prices in my favorite resource, the Prairie Moon Nursery catalog, to create this list. Please add your ideas—modify this strategy or add to it; modify this possible list of plants by removing or adding to it—all based on your experiences!! Seeds of many native plants have built-in protections that keep them from germinating at the wrong time, such as before a frost, in the fall, or during droughts. In the wild, seeds will lie dormant in the soil until the right conditions are present to insure success. There are a variety of methods that seeds use to break that dormancy, and many plant species have specific needs. To successfully grow a plant from seed, we often need to learn how specific seeds naturally break their dormancy. We can use these methods, called stratification, to increase the chances of seed germination. Methods for breaking dormancy are quite varied and rely on one or more factors including air temperature, time, moisture, light vs. no light, and soil temperature. The most common methods involve a combination of moisture, air temperature and time. It can be as simple as two months in cold, dry storage and as complex as a lengthy sequence of alternating cold, moist periods, with warm, moist periods. (This method generally means a seed will require over a year to germinate). There are general how-to guidelines derived from the experience of growers and hobbyists that will improve your success. Catalogs from native plant nurseries are a great source of information for particular plant species. Also, this website Native Plants for Tennessee operated by the University of Tennessee’s Smart Yards Program includes a description of 12 different methods for breaking dormancy in our Definitions section under Germination Codes. This germination code information was provided courtesy of Prairie Moon Nursery, a native plant source in Winona, Minnesota. In addition, each plant in our Native Plants for Tennessee database has a description of which method or methods work best. Plant specific data on this website is taken from a host of native plant resources including the Prairie Moon Nursery catalog. The two most common methods are: (1) cold, dry storage, and (2) cold, wet storage. These methods are commonly called cold, dry stratification and cold, wet stratification. Cold, dry stratification typically means you do not need to provide any pre-treatment. The native plant nursery will have stored the seed under these conditions prior to its sale. You can plant the seed as soon as your planting schedule requires it. Prior to planting, simply store the seed in a cool, dry place or under refrigeration at 33-40 degrees F.
(1) Add 1 -2 teaspoons of water to 1/3 cup fine sand for each 1/8 oz of seed to be treated. (2) Mix the seed, sand and water and refrigerate in a sealed plastic bag for the required time period. (1) Rinse a coffee filter or paper towel in water and squeeze out excess water. (2) Place seed in a single layer on the damp paper, fold over the paper and place it in a sealed plastic bag. (3) Add a dry paper towel inside the bag to help maintain even moisture by pulling excessive moisture away. (4) Store in the bag in the refrigerator for the required time period. From a very practical standpoint, the easiest way to do cold, wet stratification is to let nature do it for you. Simply plant the seed outside in its designated spot in late fall or early winter and allow the seed to go through nature’s stratification process. This eliminates the need to monitor your refrigerated seed for premature sprouting, mold, or drying out. However, you will need to increase the amount of seed that you plant to allow for seed loss during the winter because seeds are susceptible to hungry birds or rodents, can be blown away by wind, and washed away by rain. Always remember, each plant has its own set of adaptations for germination. Be sure to check the specific germination requirements for the specific plant species you want to grow. It is a little more work, but it can make the difference between success and failure. I am a gardener, one who actually enjoys his addiction for plants. I have been a horticultural educator for 30+ years. Beginning my retirement years provides me with more time in my garden and more time to share my profession with those whose company I enjoy the most—you who till the soil. Over the past 33 years, I have worked as the University Extension Area Horticulturalist in east Tennessee and in southwest Iowa. Over the past 23 years I have organized hundreds of educational meeting for commercial nursery and greenhouse growers, landscapers and garden center employees. I continue to teach training classes for the University of Tennessee Master Gardener program. From 1974 to 1977, I served as Home Ground Extension specialist at the University of Rhode Island and taught plant identification courses at Michigan State University. I continue to write garden features and articles for magazines and newspapers. I am a frequent contributor to various landscape and nursery trade newsletters as well as to the Southern Appalachian Plant Society newsletter. I have written over 40 Extension garden fact sheets under the “Tennessee Great Gardens” logo. I have organized over 25 commercial industry and home gardening tours throughout the Southeastern and Northeastern U.S. I continue to lecture at commercial, horticultural and gardening events. In 1994 I organized the first UT Master Gardener class in the Tri-Cities region of Tennessee, and I continue to play an active role in the Master Gardener program today. Born and raised in Brooklyn, New York, I pursued a PhD degree in Ornamental Horticulture for five years at Michigan State University. I earned a BS degree (Pomology) from Cornell University in 1967 and a MS degree (Plant Sciences) from the University of Delaware in 1969. My wife Jane and I are proud parents of four children. Hobbies include photography, writing and traveling. Frost Aster — A blessing or a scourge? If you don’t have Frost Aster in your garden yet, you will! It seems to be just a matter of time. It took almost 8 years for it to show up in my gardens and then it made up for lost time by becoming one of my more abundant flower species. Frost Aster (also known as Hairy Aster, Downy Aster and White Oldfield Aster) is Aster pilosus (or if you like to keep up on the latest scientific name changes Symphyotrichum pilosum). It likes full to part sun, most any moisture level except swampy and most any soil except gravel. 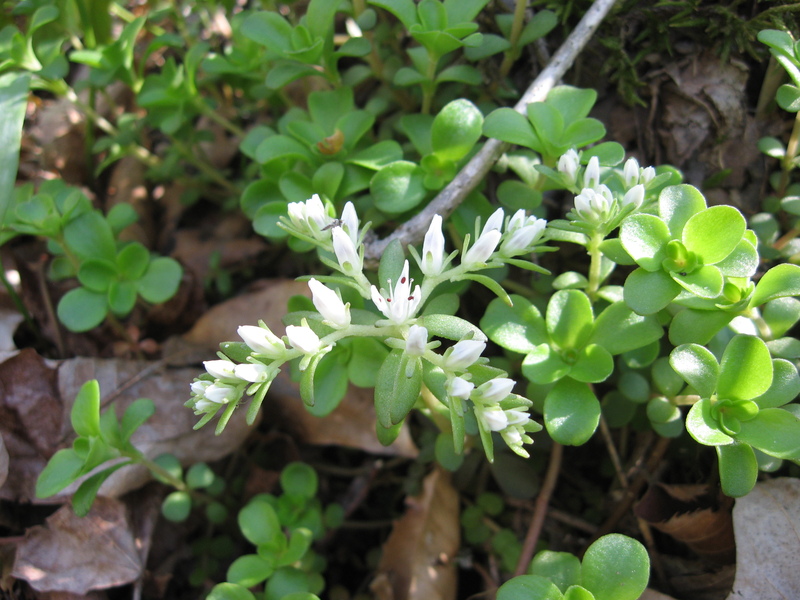 It grows typically about 3 to 4 feet in height, is covered with an abundance of small white flowers for an extended period in fall, and spreads aggressively by both rhizomes and self-seeding. I first noticed it several years ago when, in fall, one whole section of my yard was suddenly covered with white flowers. I liked the effect because it was almost like a light layer of snow. Then last summer I eliminated another section of lawn. In December, I put out a lovely selection of wildflower and native grass seeds, all of which came up nicely this past spring. However when fall arrived this year, I now have nothing but a solid stand of Frost Aster, with the other species barely visible between the Frost Aster stems. Maybe some of my seed had been mislabeled by the nursery? I called to ask, and they reassured me that there was no chance of that. One of the staff suggested that I spray the whole thing with Round-Up and start over. I really didn’t like the Round-Up solution so I started doing research, checking with any native plant specialist I could find. To my surprise, I discovered that many nurseries sell Frost Aster seed (a good sign). I also learned that Frost Aster tends to come and go in spite of the fact that it is so aggressive (another good sign). I also learned that it is a very valuable plant for bees and butterflies. As one garden reference so nicely put it—“We have lost so many flower species valuable to pollinators, we should be glad that there is Frost Aster which can help fill the gap that has been left” (another good sign). So I decided to leave everything as is and see what happens. I will either be left with a solid, perpetual stand of nothing but Frost Aster or, over time, it will gradually integrate with the other species. It is certainly a chance to learn more about how Nature operates. I have used more Round-Up than I care to admit. If I am killing off very large areas of lawn, it does seem to be unavoidable. However, I have been using some for maintenance too. So I am trying to find other strategies to reduce and maybe eliminate my use of Round-Up. The more news I read about it, the scarier it is. The FDA reports they are now finding it in our corn products and in beef from cattle that eat the corn. I decided to experiment with three alternatives—sudsy ammonia, bleach, and vinegar. To my surprise, ammonia right out of the bottle didn’t even kill little seedlings. I mixed bleach and water to the point where if I had poured it on my clothes, it would have discolored them. That had only modest impact on seedlings, and I sure wasn’t going to switch to 100% bleach! So I tried straight old 5% white vinegar. I got 100% kill on small broadleaf seedlings (less than 1 inch tall). They are totally gone in a few hours and don’t re-grow. However, grass seedlings only get a bad burn and then recover. I couldn’t wait to try it out. I tried it on everything from 3-4 inch tall weeds on down. I got total, permanent kill on all seedlings including grass, on monarda plants that were about 4 inches tall, on little violet seedlings, and even on a small patch of exotic weeds that had been trimmed in the past and were trying to grow back. I didn’t have any luck with nodding pink onion seedlings, probably due to the fact they are bulbs. It won’t permanently eliminate fully established weeds which have enough energy in the roots to grow back, but it is wonderful at killing seedlings. It is especially useful for spraying plants germinating in your wood chip mulch, in gravel or woodchip paths, in beds of decorative stone, and in bare ground between established plants. During the spring when new seedlings are constantly germinating in these areas, vinegar will immediately wipe them out with a quick spraying, and repeated sprayings won’t raise your guilt level. If you have other suggestions or experiences, be sure to post a comment or maybe even start a new blog. Since so many of us in Tennessee seem to have homes on slopes, I thought it might be helpful to post a blog on a product called “jute matting erosion control cloth” (or sometimes “geo-jute”). We have been eliminating lawn on some pretty steep slopes and then re-seeding with native flowers and grasses. We needed something to help hold the new seed in place. After killing off the lawn and all spouting weeds during one whole growing season, we seed over the area in early December and then immediately put down the geo-jute over the whole surface. We have used this product several times, and it makes a world of difference. It is especially good for doing large areas. It is a very open mesh, made out of burlap, and comes in 4 foot wide rolls that are 225 feet long (and weigh about 75 lbs. each!). It is very easy to apply. Simply cut the strips to the length you need, roll them up, start at the top of the hill, and just let the cut section unroll itself right down the hill. Even though it has a very open mesh, that technique works fine. Then we take some galvanized fencing with 2″x 4″ openings, cut the 2″x 4″ sections into pieces open at one end (much cheaper than buying those expensive fabric pins at the garden center), and use them as pins to hold the geo-jute in place; it doesn’t take many. It decays into the soil after about 12-18 months so you never have to remove it or have it ball up like those awful nylon meshes that never decay. In the meantime, it not only keeps the seed from flowing downhill in a rain storm but provides a little matting to help hold moisture in the soil while the seeds are germinating. It does need to make contact with the ground in order to work so it would not be good for spreading out over an area with a lot of plant material still present. You won’t find it at your local gardening store. We live in NE Tennessee and our closest Tennessee-based supplier is Great Western Bag Company in McMinnville, TN. They will ship to you. If you live in another part of Tennessee and use a different supplier, be sure to post a comment and let us know where you buy it. Free Seed Give-a-Way!! Extended to March 15th, 2018! We still have Purple Coneflower seed available! Therefore, we are extending the end date to March 15 while supplies last. 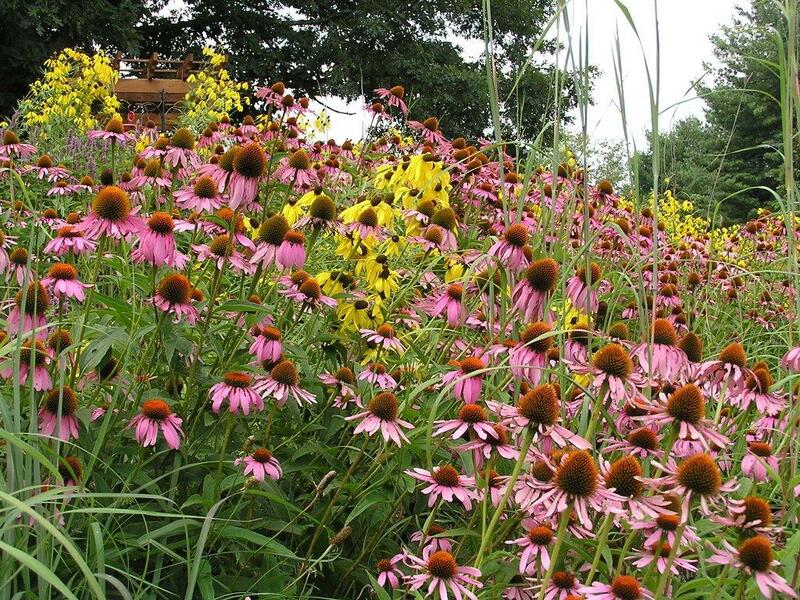 Tennessee Smart Yards is giving away a packet of Purple Coneflower (Echinacea purpurea) seed (350 seeds) when you post a comment on a plant in the TNSY Native Plant database. Limit 1 packet per comment and two comments per person. This is a wonderful chance to get a free package of native seed to try in your garden plus a chance to help others learn more about native plants based on your own experience. Please post the comment directly on the specific plant (not on this seed give-a-way blog) and provide helpful information or observations about the plant to assist other people who are viewing your comment. * This offer is only available to U.S. residents while supplies last. Unfortunately international shipping is not available at this time. After over 10 years of converting roughly one-half acre of lawn to native plants, I still struggle with how to conceive of my planting process and goals. I like to imagine that I am creating a native plant meadow that will eventually become a natural, dynamic community that takes care of itself. However, the huge amount of unending work involved makes my first thought seem naive, and I have moments when I think what I am trying to do is impossible. I have simply undertaken an out-of-control gardening project that exceeds my ability to handle it. I recently came across two books that seem very relevant to these two perspectives. The first one is The One-Straw Revolution by Masanobu Fukuoka. He was a Japanese farmer/philosopher from Shikoku Island who lived from 1913-2008 and was an articulate advocate of farming in harmony with nature. The other is Planting in a Post-Wild World by Thomas Rainer and Claudia West. 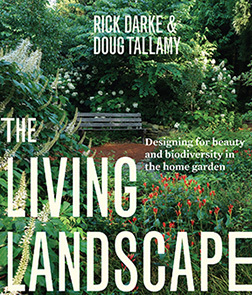 These two authors offer a new modern perspective on sustainable landscaping with native plants. To outsiders, his farm appeared somewhat wild and unkept. However, following these 4 principals, he was able to produce volumes of rice, wheat and oranges per acre on his land that matched or exceeded that of the commercial farm industry, and he did it with fewer hours of work. After reading his book, I am encouraged to ask myself the same question—what can I not do? For example, I can cut back on weeding and follow his guideline –“Weeds play their part in building soil fertility and in balancing the biological community. As a fundamental principle, weeds should be controlled, not eliminated.” If I work in harmony with nature, maybe I can succeed at creating a natural, self-sustaining plant community and eventually my workload will decline. Although I have no illusions that I am re-creating an original intact native plant meadow in my yard, this assessment leaves me feeling pessimistic about my potential success at creating a natural, ungroomed, functioning plant community on my half-acre. In their book, Rainer and West go on to describe how to use native plants to design gardens that function like naturally occurring plant communities and provide the natural beauty that we have lost. Although they offer wonderful ideas for a more ecologically connected landscape, the work and process involved sounds an awful lot like traditional gardening and definitely not a landscape left to its own dynamic process. Maybe there is no going back. So I seem to have come full circle and still don’t know how best to assess my yard. For now, I lean toward following Fukuoka as much as I can and see what happens. There is a great phrase used to describe his farm—“the unkept exuberance of natural growth.” I can continue to learn to see the beauty in that unkept exuberance and enjoy the mobs of bees, butterflies and birds that thrive on it. And hopefully, the amount of work will decline! Why Can’t I Buy Tennessee Native Plants…..or Can I? I have often complained that my local greenhouses sell very few plants native to Tennessee, and I hear my gardening friends make the same complaint. I wonder how suppliers can ignore the beauty and benefits of our native grasses, flowers, trees and shrubs. Perhaps if they knew our interest in these plants they would stock more? At the same time, I have been working on the Tennessee Smart Yards Native Plant Database, slowly making my way through our many species of native plants. Recently I decided it was time to update our count of total number of plants in the database, and I discovered that we now have 750 species! To top it off, any plant in the database is there not only because it’s a Tennessee native but because it is for sale commercially! Granted you will find very few of these plants for sale at your local greenhouse, but they are available from a wide variety of vendors online. Who would have guessed that we have such an awesome wealth of opportunities to purchase our native plants! I think I am going to have to stop complaining and start doing more buying. Now is the perfect time to plan for spring plantings. For your convenience, I have included what we have found for online suppliers (https://tynnativeplants.wordpress.com/buying-native-plants/) on our Buying Native Plants page. Maybe local nurseries will start to take notice that these are desirable species. 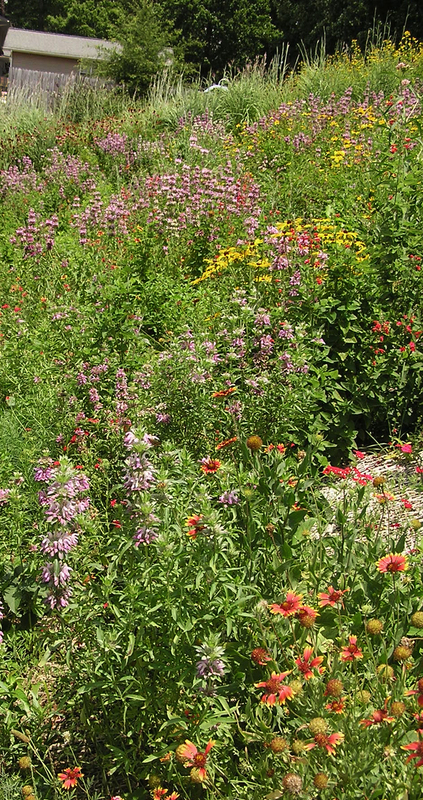 Until then, use this resource as a way to incorporate more native plants into your landscape! We are fortunate to have the University of Tennessee Herbarium, a nationally recognized facility, that houses over 600,000 specimens of plant species, including flowering plants, ferns, mosses, liverworts, and fungi. One of the Herbarium’s many resources is the Tennessee Vascular Plant Occurrence Database. It is the resource we use in the Tennessee Smart Yards Native Plant Database to indicate where plants listed in our database occur within the state. Although we provide only a general description of where plants occur in Tennessee, you can easily use the Herbarium’s database to identify specific county locations for a plant and whether that plant occurs naturally in your county. We live in one of the most botanically diverse and interesting states in the nation, and the Vascular Plant Occurrence Database contains nearly 9,000 photos and 2,900 distribution maps of plants. One cannot help but wonder how such a large database was created. The key has been dried and pressed plant specimens. Collecting plant specimens is an old art, practiced since the late 15th century, when they were collected for medical, herbal or ceremonial uses. Today they are collected as part of scientific research, housed in herbaria, and used to provide a record of when and where a plant was growing. The Tennessee Herbarium’s collection of dried specimens dates back to 1934, when a fire burned the previous collections. In addition, Austin Peay State University, Vanderbilt University and the University of Memphis provided county records, and ultimately all the records associated with dried specimens were loaded into the Tennessee Vascular Plant Occurrence Database in 1996 and made available on-line in 1997. Although the state is pretty well collected with thousands of records, new information comes in on a regular basis and is added to the database. Generally, new additions are based on specimens that are pressed and dried. However, sometimes it is done from high quality photographs. Most new submissions come from herbaria staff but also from members of native plant societies and graduate students. However, anyone can submit a sample for possible inclusion in the database, either to demonstrate a new plant species or a new location for plant species already in the database. If you don’t have a plant press, you can press the specimen between sheets of newspaper in a book until dry or you can submit a high-quality photograph. Either way, be sure to note the date and exact place where the plant was found. Help Us Improve Our Website by Sharing Your Experience! We believe there is a wonderful treasury of information among our visitors. The Tennessee Smart Yards Native Plant Website is an ideal place to share your information with other plant enthusiasts. Our database has a huge amount of helpful information, and we typically have around 100+ visits per day! Share your advice on how to grow plants, what to avoid, great plants to try, and other relevant experiences in your comments. This information is extremely helpful to others who are considering various species of plants for their yards. In addition, sometimes information gained from experience may not be widely available or even not reported for the less common species. Also, if you have a knack or interest in writing, become one of our bloggers! We are always looking for plant enthusiasts that are interested in contributing articles to our site. Posting a comment or blog is easy. For comments on a specific plant, just click the “Comment” button and enter your information. If interested in blogging, please contact us at tnyards@gmail.com to register. We strive to make the process as easy as possible, and all requests and informational posts are processed as quickly as possible. Take a moment to explore and add your experiences to the website and help improve our knowledge of Tennessee native plants! Buttonbush (Cephalanthus occidentalis), aka Button-willow or Honey Bells, is a medium to large native shrub with many fine landscape attributes. This unique flowering shrub is a favorite in attracting beneficial wildlife. It populates bogs, swamps and pond areas, as well as dry limestone bluffs in the eastern U.S. and southeastern Canada (USDA hardiness zones 5–9). heads gives it a distinctive pincushion appearance. Flower heads mature into hard spherical ball-like fruits containing tiny two-seeded nutlets. Dried seed balls persist all winter long. Give the buttonbush room to grow. This multi-stemmed deciduous shrub grows 6-12 feet tall and 4-7 feet wide. On older shrubs stems and trunks appear twisted when twigs are bare of leaves in winter. Pruning is usually unnecessary and is done in early spring to shape or reduce plant dimensions. Old neglected plants may be revitalized by cutting them back near to the ground in late winter. 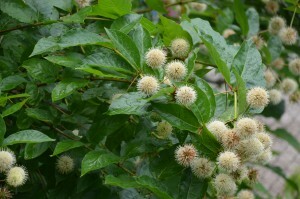 Buttonbush has year-round garden interest with late spring flowers, summer and fall foliage, and fall/winter fruits. Narrow oval green deciduous leaves emerge in spring and turn shades of red in fall. It has no serious disease or insect problems. Foliage is poisonous to humans and livestock; deer may snack on new spring growth. Buttonbush is best planted in wet, humus-rich soils and in full sun to part shade. Favorite landscape sites include in rain gardens or the edge of ponds. Established plants after 1-2 years are moderately drought tolerant. Fragrant flowers attract butterflies, bees, and hummingbirds for nectar. Leaves are the larval host for some butterfly species. Waterfowl, quail, and other birds feed on the nut-like seeds. Cut flowers look great in fresh summer bouquets or in dried arrangements. This blog is taken from “What Grows There”– a website created by Hugh Conlon. It provides a host of helpful information on a wide range of gardening topics, from many species of flowers, trees, shrubs and grasses to practical hints on garden maintenance, garden problems and lawn care. Hugh has worked for 30+ years as a horticultural educator. Before retiring, he was most recently horticulturist for University of Tennessee Extension, Washington County. Link to original post on ” What Grow’s There” here. Lemon Mint or Purple Horse Mint (Monarda citriodora) is a Tennessee native annual wildflower, and it is turning into one of my absolute favorite flowers to grow. I thought it would be fun to put up a post on it. It is very pretty, gets about 2-3 feet tall (not so tall that it is likely to need staking), blooms most of the summer, is not fussy about soil (one site even says it prefers clay) and tolerates drought. It also attracts lots of butterflies and bees. I went out this morning and I had both a Tiger Swallowtail and a Red Admiral feeding on it. Lots of native bees are always on it. The only drawback that I have found is that since it is an annual, it needs to re-seed for the following year. In my first major planting, it came up really well but disappeared after the first year, so it doesn’t seem to be too competitive with other plants. I tried another new planting area this past spring, and I now have lots of this plant. I am hoping for better luck with it re-seeding for next year. But even if I don’t get new plants next year, it does make a wonderful, spectacular “nurse crop” on a first year planting of native species. Useful Info on a Practical Question — How Many Seeds per Square Foot? In the past, when I am converting an area of lawn to native plants, I always go through the process of trying to figure out just how many seeds I need to order. I am a bit variable in the number of seeds I use per square foot, and I got to thinking I need to get a better handle on this question. If you are doing a small garden and just want to plant seeds in a row, it is relatively easy. However, if you are going to broadcast seeds by hand over a larger area, for example 30’ by 40’, it gets a bit tricky. (1) If you are planting on a slope of 3:1 or more, you need to increase the seeds per square foot by 50%. (A 3:1 ratio means that for every 3’ of horizontal run, there is a vertical change of 1’ of ascent or descent, which is about a 4” change per foot.) On a slope, seeds are more vulnerable. (2) If you are hand-broadcasting the seed, you need to increase the number of seeds by 30% to account for fact that seed is not uniformly buried in the soil. (3) If you are putting seed down in a dormant period, e.g. in fall so that the seeds can go through the required cold stratification during the winter, you need to increase the number of seeds by 50% to take into account the extended time for loss of seed due to birds, rodents, being blown away by wind or washed away by rain. (4) Most seed formulas count number of seeds needed based on the assumption that all seeds are viable. In reality, not all seeds will germinate. Growers calculate the percentage of “pure live seed” or PLS. PLS takes into account the percent purity of each seed lot and the percent of successful germination in that seed lot. Packages of grass seed usually have the PLS designated on the package, usually about 80%, which means 80% of the seed should germinate. However, PLS is rarely listed on flower seed. I talked to a rep at a large native plant nursery, and he said you can probably assume that flower seeds on average also have a PLS of 80%. This calculation process is not as complicated as it might sound. It is much easier in an example. Assume a worst case example and that every situation listed above applies……you are planting a native seed mix on a slope in the fall by hand broadcast. Just to repeat….this is not a science, and I know there are other ways to calculate and adjust the numbers. In fact, I find that sometimes an influential factor is how many seeds I have left over and I just want to add more to use them up. Still it is helpful to have a starting point that you can tweak to your own situation. Plus I went back and looked at my seeding rate on my plantings, which so far have worked pretty well, to see how they compared, especially since all of the above conditions apply to me. I was pleasantly surprised to find that I have been in the ballpark on my plantings, so it seems like the formula works for me. Sorry for such a long blog but hope it is helpful. Any related advice is appreciated!! I am finding that over time there seem to be a number of goldenrod species planting themselves in my native plant gardens. I haven’t tried to ID them because I figure I need to catch them in bloom before I have any chance of figuring out what they are. But I know they send out aggressive rhizomes and spread into large patches if I don’t happen to notice them for a couple years. Even if they are native, they are sure weedy because I even see them growing in the rotting plant material collected alongside the curbs in the street. 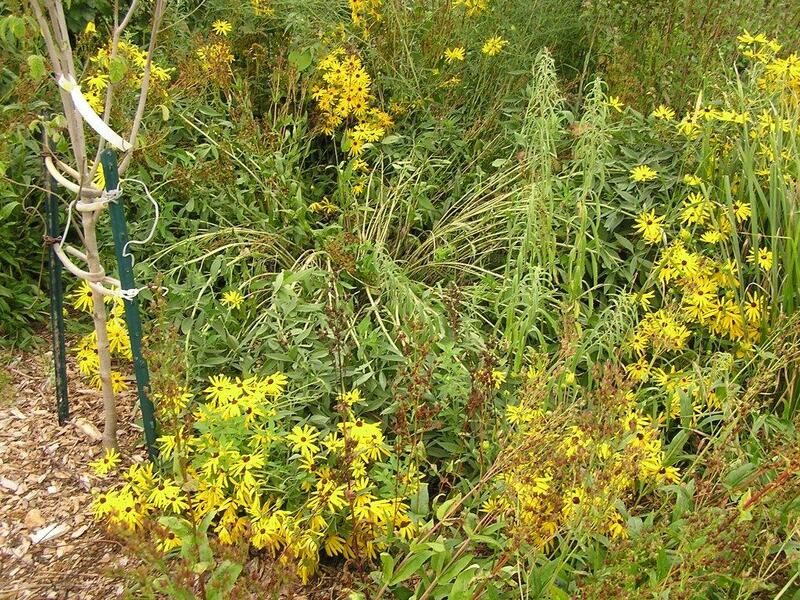 I think I am seeing at least 3 different species, including Tall Goldenrod (Solidago altissima), which I definitely don’t want because that stuff seems to kill anything that grows next to it. In fact, I don’t think I want any of them given how aggressive they are, but I have just under 1/2 acre in total and weeding is getting tough!! Does anyone know what these species generally are? Do you know what happens if you just do a modest control effort, i.e. pull them up when you happen to see them, or even what happens if you do nothing? Am I eventually going to have pretty much nothing but goldenrod or is this kind of a pioneer species which will eventually get crowded out? Or maybe it will just be another species mixed in with a wide variety of other plant species…..I should be so lucky! Although I have done a lot to fight this stuff, including spraying Round-Up on very large patches that accidentally escaped my attention, I am definitely getting the feeling that this is a battle that I am losing. What are your favorite native plants? Given the number of native plant species that are available for purchase, I figure it will help most all of us to have a place to look for ideas. Plus I find that I often get into the most problems when I buy something I know nothing about! So I thought it would be great if people visiting this website have a spot to make recommendations based on their experiences. It would especially help people who are just getting started. If you have one or more favorite species–flowers, shrubs, trees, grasses–please take a moment to add a comment, list your species and add a few words about why you like it. Thanks! “FREQUENT INSECT PROBLEMS” — A Good or Bad Trait for Native Trees in Our Yards? With growing recognition of how important insects are in the food chain especially for birds, it has gotten me to thinking about how often we reject the idea of planting any native species in our yards that is designated susceptible to frequent insect problems. Since insects provide critical protein for birds and are essential to their babies’ survival, maybe a complete reversal of this kind of thinking is in order. A tree that suffers from insect damage becomes a desirable planting for the yard. Most of our more objectionable insect “pests” are great bird food. Chickadees, wrens, nuthatches, hummingbirds and tufted titmice eat aphids. Nuthatches and woodpeckers eat borers. Cardinals, wrens, woodpeckers, chickadees, nuthatches and tufted titmice eat bagworms and webworms. Chickadees and tufted titmice eat scale insects. The list of bird food is a long one, including many types of caterpillars and beetles, stinkbugs, moths, lawn grubs, whiteflies, ants, plant lice, millipedes, weevils, and wasps. Yum! If I had the space left in my yard, I think it would be a fascinating experiment to set aside a portion of my yard and only plant native tree species labeled “susceptible to many insect problems.” Can’t you just see it…a tree grove of “lower class, misfits”! It certainly challenges the stereotype. I love it! This book has just come out, and it is great reading for anyone who wants to work with native plants in their yard. I just finished reading it, and while I don’t want to write or post a book review here, I thought it would be fun to highlight the key points that I learned and what I would do differently in my yard if I had read the book before I started planting. The book is focused primarily on understanding the benefits of woodland plantings in our home gardens. It focuses on the structure, functions and benefits of native species of the forest with lots of helpful tips on good species to choose and how to plant them. Plus there are lots of gorgeous photos to illustrate the points being made. The book describes each of the distinct, horizontal layers of a forest—canopy trees (the uppermost layer), understory trees (growing within the canopy), shrubs, herbaceous plants and the ground layer of accumulated organic matter and soil. They review the functions and plants of each layer as well as the creatures that live in each layer and beautifully describe the interactions between the layers. When I created two smaller areas of woodlands in my yard, I knew about the various layers of the forest. However, it never occurred to me to actually try to build the layers one on top of the other. I put in trees here and there and shrubs here and there, with a goal of eventually having full shade. Although I planted a few canopy trees, I put my understory trees outside the canopy such that the canopies of all the various trees would meet when the trees were full sized. Then I filled in the open spaces with shrubs and herbaceous plants. I didn’t think about building my woodland garden from the top down. However, according to the authors, it is possible to plant all the layers at once and have it work. That is a bit of a revolutionary idea. Now I am trying to amend my plantings by going out into my gardens to find openings where I can sandwich in more trees and shrubs and better implement the concept of layers. Unfortunately for me, my spacing is already pretty well set. Adding more canopy trees now with their 50-80 foot spread is out of the question. Adding more understory trees is possible but requires me to try to sandwich them in where I can find the appropriate amount of space needed. It seems like this concept will work in our home gardens even if the yard is small. If you need to, you can limit yourself to just one large, canopy tree and then plant the smaller understory trees, shrubs and herbaceous layer beneath what will be the canopy once the canopy tree matures. There are a number of species that can take both shade and sun. It does require us to think well ahead and arrange our plantings to take into account the plants’ mature size and probably provide a little more water to the understory plants until they become shaded. But other than that, it is a fun, creative way to approach creating a mini-forest in our gardens and yards. Plus you get the wildlife benefits of the layers. Gong, Going, Gone — What Is Happening in My Native Plant Garden? Scientists recognize that native plants tend to occur in communities where species with similar limits tend to grow together, and these communities are defined by the dominant plant species in them. It is also recognized that the there is a predictable and natural succession over time where one plant community gradually or rapidly replaces another, although there are differing theories of how this complex process of succession occurs. Understanding the structure and functioning of native plant communities is the focus of many scientific studies that go beyond the understanding of most of us native plant gardeners. However, after watching all the significant changes that occur in my native plant gardens, I can’t help but draw some parallels. It seems to me that in a sense my gardens are mini-communities that are going through their own process of succession. I have two plots where the changes have been dramatic over a 4-5 year period. In one 40’ by 35’ area, I have gone from a planting dominated by Purple Coneflower, Pale Purple Coneflower, and various Penstemons to one dominated by Big Bluestem grass with the original species either gone or only a handful remaining. In another, 50’ by 40’ area, I have gone from an area with sweeping stands of Golden Alexanders to one dominated by Slender Mountain Mint with only a few scattered Golden Alexanders remaining. Sometimes I hate to see the change and really miss my original mix of species. All of this has gotten me to wondering how these changes happen and what drives the process in my own yard. Even if what I am witnessing is not true community succession as scientists define it, it is some form of succession. Plus knowing that succession will occur suggests some important basics that a person can take into account when doing a native plant garden. First is to just recognize that there is going to be lots of change. The characteristics of the planting site – soil, moisture and light levels—will influence the changes over time. Having an initial seed mix with too large a percentage of seeds of an aggressive species can eventually put that species in control of your garden. A seed mix that has a small number of aggressive species will likely lead to a planting heavily dominated by just a few species. It isn’t always just which plants are aggressive. I talked to a staff person at one of the large native plant nurseries about what influences succession in our native plant gardens. He described a garden at their nursery site that had lots of Early Sunflower, a plant that I know from personal experience to be very aggressive. He said that one spring, they were suddenly gone and no one knew what had caused the change. One of the most important factors affecting succession is the total number of plant species in the original seed mix. That seed mix forms the seed bank from which my mini-community will draw as the years progress. Use as large a number of species in the original mix as you can. A large number makes for more plant diversity and less chance that one or two species will take control and crowd out others. It should also make the succession process more dynamic and a little closer to what occurs in nature. Disappointments aside, it is fascinating to watch all the changes occur and part of the fun of native plant gardening. Looking back on my efforts to replace large sections of lawn with native plants, I can think of three things that I sure wish some gardening wizard had told me in advance. Although everyone’s planting experiences will be, to some degree, unique to their situation, I thought it would be useful to pass along my bits of wisdom in hopes they will be helpful to others. 1. Diversify your plant species. Don’t depend on just a few species of grasses or flowers to make up the bulk of your planting area. If you rely on just a few species and one or more of them turns out to be problematic (too aggressive, too floppy or weak-stemmed, ugly, etc. ), you are headed for problems. It is darned hard work to get rid of something planted in volume once you decide you are sorry you planted it. A naturally-occurring plant community can have 100 species or more. So follow Nature’s example and diversify, diversify, diversify. 2. When you select species for your planting area, take into account Nature’s amazing ability to spread seeds far and wide. Although some species are very slow to spread, many of them are aerial acrobats that make you wonder how they do it. Don’t select any plant species that you aren’t willing to have appear in all your other planting areas. The only alternatives are to be a determined weeder or to have done your homework ahead of time and select species that self-seed poorly. Otherwise you are headed for a losing battle of trying to keep plants in their assigned locations. This concept may be something we gardeners love to do, but Nature is totally oblivious to it. I once read a description of a gardener who took 13 years to get her native planting established. I naively thought “That is not going to happen to me. I will be done in 2-3 years.” Although I knew that native plant communities are dynamic, I didn’t fully appreciate what that means, nor did I understand just how much fun “dynamic” would be. I still had the traditional gardener’s mentality of getting a flower bed “done,” a fixed end product so to speak. If native plants had a mantra, it would be “Change!” Once your initial planting is done and plants start coming up, the changes begin, no matter how much planning you may have done. Some plants come up, last long enough to encourage you, and then totally disappear because they aren’t happy where they are. Some plants love their site and can’t spread fast enough. Some plants don’t like where they are and happily move to a location they like better. Proportions and locations change, and you never know exactly what the next year will bring. Eventually a large planting will stabilize, and I now understand why the woman’s garden took 13 years. However, the change never totally stops. So take advantage of this dynamic process. There are always opportunities to try adding a few new species each year. Tennessee has such an abundant wealth of native flowers and grasses to try. You will make your planting better and have more fun at the same time. In a natural setting, new species often occur in areas of disturbance that create openings, for example a downed tree that suddenly lets in sunlight. Find areas of disturbance in your planting area, e.g. bare ground where other plants have failed or where you have ripped out weeds or some plants you wish you hadn’t planted. Use these areas to introduce new species. Then you have the fun of anticipation, waiting to see how the plants will adapt and change. Each year comes with its own special surprises, and you get to look forward to what the next growing season will bring. Almost by accident I discovered a Tennessee native plant called Standing Cypress (Ipomopsis rubra). It has a number of other common names including Scarlette Gilia and Flame Flower. It is a striking, beautiful biennial with brilliant red tubular flowers spaced throughout the entire length of the 2-5 foot tall spike. This past spring, I had planted about an ounce of Standing Cypress seed, scattering it by hand, here and there across the top of the soil surface. Then I forgot all about it, except that on and off all summer long, I kept noticing these little green feathery-looking plants popping up here and there in my planting area. When they hadn’t grown more than 3 or 4 inches tall by fall, I figured they might be a biennial. I just didn’t know what they were. I went back to my seed lists to see what I had ordered, and of course, it was Standing Cypress in its first year. The more I read about Standing Cypress, the more I am looking forward to next summer. It is a low-maintenance, easy-to-grow plant that deer don’t like and hummingbirds do. It is a dependable re-seeder and once you get it started, you will have it blooming every other year. You can get it to bloom every year if you plant seed two years in a row. In their Native Plant Database, the Lady Bird Johnson Wildflower Center describes this plant as ”one of the most successful species” in their field testing from seed. It likes full to part sun and medium to dry moisture. Its preferred soils are rocky, sandy or loamy. Since my soil is mostly clay, it will be interesting to see what happens. But so far, so good! This plant sounds like a great combination of beauty, ease and dependability. I will update this post next summer and add some pictures. If anyone else has tried this plant, let us know how it worked for you. Here’s to next summer! I got into experimenting with annuals out of necessity when I was trying to start native perennial wildflowers, which need that first year or more just to get established. Annuals gave me a good, temporary filler in my planted areas. Now that I have tried them and found how easy and colorful they are, I am always looking for opportunities to sandwich in a few annuals here and there. You can buy large quantities of seed for very reasonable prices, and annuals make a great addition to your native plantings. I thought it would be fun to share those species that I have tried and liked. Our TYN blog is a great place to exchange ideas and information, so I hope others will add their comments, thoughts and other plant species! Indian Blanket or Firewheel (Gaillardia pulchella). This plant has red flowers with yellow rims. It likes heat (and tolerates drought), sandy soil and full sun, potentially blooming clear into October. It is listed as getting 1 to 1 1/2 ft. tall but mine are consistently more like 3-4 ft., which can tend to make them a little floppy. I have plants in clay soil, which they don’t seem to notice, and the species re-seeds very readily for me. It occurs in 4 counties in Tennessee, mainly in Middle Tennessee and in eastern Tennessee’s Ridge and Valley Province. Lemon Mint or Purple Horse Mint. It is a typical member of the Mint family with square-shaped stems, and flowers are deep purple to lavender. It gets 2-3 ft. tall, isn’t fussy about soil type and likes full to part sun. It blooms for most of the summer. Hummingbirds, butterflies and bees love it. It is my favorite plant out of all the annuals I have tried. I planted it on a fairly steep slope of clay soil and had great luck with it. Even though it is easy to start from seed scattered on bare ground, my only disappointment is that it hasn’t re-seeded for me at all. It occurs in isolated counties in Middle and East Tennessee. Plains Coreopsis or Calliopsis (Coreopsis tinctoria). This plant has striking yellow flowers with maroon centers and gets 1-3 ft. tall. It prefers full sun and isn’t picky about soil type. It likes damper soil so it is good for areas with poor drainage or that tend to stay soggy for periods of time. I have only tried a variety of this plant called Dwarf Red Plains Coreopsis (with the same scientific name). It has very striking, solid mahogany-red flowers and blooms from mid- to late summer. I had good luck getting it to come up and bloom, but then it disappeared, probably because my soil didn’t stay wet enough. However, it was still worth having, just for that solid deep, red color. The species is native to Tennessee and occurs statewide. The dwarf variety appears to be originally native to mid-western U.S. and has escaped from cultivation in the eastern U.S.
Clasping Coneflower (Dracopis amplexicaulis or Rudbeckia amplexicaulis). This rudbeckia has black, cone-shaped heads surrounded by bright yellow drooping flowers. It takes full sun and isn’t picky about soil. 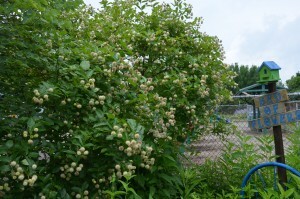 It gets 2 feet tall and potentially blooms from early summer to September. Seed has a high germination rate, and it is a very heavy re-seeder. I have to add that I won’t be planting my new seed until next spring, but I put it on the list because of all the good things that I have read about it. It is native to the mid-western and southern states, including our neighboring states of Missouri, Arkansas, Alabama, and Georgia. Also Tennessee DOT sometimes adds this species to their native seed mixes that they plant along Tennessee roadsides. Scarlet Sage (Salvia coccinea). This plant has fluorescent red tubular flowers and can get up to 3 feet tall. It likes full to part sun and sandy to gravelly soil. It potentially blooms from early summer to the first frost and is a hummingbird magnet. Even though it is found growing wild in the southern U.S., it was originally introduced from Brazil. Although I usually try to stick with Tennessee natives, I find this plant hard to resist. It is so striking and brings in the hummingbirds and butterflies that I love. I buy seed by the ounce and scatter it widely. Although most seeds don’t come up on my clay soil, I get enough plants to make it worthwhile and even a little re-seeding. However, I do find that my plants don’t start blooming until late summer or early fall. You can find suppliers for bulk seeds of all these species, usually somewhere between $4.50 and $9 per ounce. My favorite sources are Wildseed Farms in Fredericksburg, Texas, Everwilde Nursery in Sand Creek, Wisconsin and Easywildflowers.com in Willow Springs, Missouri. If you have other plant species you have tried or other favorite seed sources, please be sure to post them. Also be sure to post any techniques you have tried that improve plant growth and performance. When selecting a new plant species to grow in your yard, please do keep an eye out for plants that have been labeled “invasive.” Sometimes catalogs of annual wildlfowers list species that are considered invasive but make no mention of any such problem. If you have doubts, check out the species first with either the USDA Plants Database (my favorite resource!) or the website of the Tennessee Exotic Pest Plant Council. Since I prefer to plant large areas of my yard in native flowers and grasses, money always seems to be the number one criteria in my plant selection. The dilemma in selecting anything out of the ordinary is that I have to buy either live plants or expensive seed that can run $50 to $100 an ounce. So I have tried to teach myself to grow plants from seed in starter pots, using only $2 seed packets. Every year I try a new list of species. Each time is an experiment, some seeds come up and some don’t, and each success is an exciting surprise. I thought it would be fun to post my favorite 10 plants that I have found relatively easy to grow from seed in pots. As is typical with wildflowers, every species on this list requires 1- 2 months of cold, damp treatment before the seed will germinate. So in late December, I plant the seed in little peat pots (about 40-50 to a tray), water the pots and put them out in the garage for the winter. I cover the trays with a sheet of wax paper and top that with a few sheets of newspaper; I check them every few weeks to make sure they are not drying out. On March 1, I bring them into the house and put them on the floor under grow lights that I have hung on the underside of a metal folding table. Then the fun begins, and I get to see what works and what doesn’t. Here are the plants I’ve had the most success with and consider desirable additions to my native plantings. Prairie Phlox (Phlox pilosa). This is a wonderful sun-loving phlox that gets about 1½-2 ft. tall, likes soil moisture from moderately wet to dry, and flowers in whites,pinks and lavenders. My seed catalog labels it “difficult from seed,” but I have done it two years with no problem (although of course not every pot germinated). Blue Salvia (Salvia azurea). This salvia likes full to part sun, grows 2-3 ft. tall (more like 4 ft. for me) and likes medium to dry moisture. It does tend to lean when it gets tall so it needs the support of surrounding plants. However, it has beautiful blue flowers which the bees can’t stay away from. Missouri Evening Primrose (Oenothera macrocarpa). This primrose likes full to part sun, medium to dry moisture level, and grows 6-12” tall. It prefers lean soil; in fertile soil, it can be overwhelmed by its larger neighbors. You may already know this plant for its eye-stopping, huge, bright yellow flowers. Its only drawback is that it does tend to form a somewhat messy tangle of leaves and stems, but with flowers like that, who cares! Rattlesnake Master (Eryngium yuccifolium). This plant likes full to part sun, moderately wet to moderately dry moisture and will grow in just about any soil. It is an unusual and striking architectural plant that gets 2-4 feet tall. It reminds me of a yucca. Photo courtesy of Illinois Wildflowers Elm-leaved Goldenrod (Solidago ulmifolia). This plant likes part to full shade, medium to moderately dry moisture, and grows about 3 feet tall. I had tried some of the better known goldenrod species with poor results so I decided to try some of the lesser known goldenrods instead. I was not disappointed; this flower has beautiful sprays of golden yellow flowers that brighten any shady spot. Photo courtesy of Illinois Wildflowers Jacob’s Ladder (Polemonium reptans). This is a lovely woodland plant that I had always incorrectly assumed would be hard to grow from seed, as many woodland plants seem to be. It grows in part to full shade, likes moderately wet to moderately dry soil, and gets 12 inches tall. Small-flowered Leafcup (Polymnia canadensis). This is a woodland plant that needs light to medium shade, medium to moderately dry moisture, and loamy to rocky soil. It gets 2-4 ft. tall, has small white flowers with scalloped edges and is most striking for its large deeply-notched foliage. It is an uncommon flower and not known to the public. I had never seen it or heard of it; I just wanted to try something unusual. Anise Hyssop (Agastache foeniculum). If you research this plant, you will find that I am cheating on this one because it is technically not a Tennessee native. The nearest state where this plant occurs is Virginia. So maybe it does creep over the state line now and then? However, this plant has so much going for it that I add it to my native garden anyway, and I enjoy looking at it every time I walk by. It grows in sun or shade, likes medium to dry moisture, and gets 2-3 ft. tall. It is so easy to grow from seed, re-seeds very nicely, is attractive, blooms for a long period, and loved by bees. With hundreds of species out there to try, this list barely scratches the surface. Be sure to post any species you have tried that worked well for you. We would love some suggestions. What kind of Liatris can I grow in my garden? I consider the Liatris species to be the royalty of the native wildflower world. They are tough, beautiful and butterfly magnets. However, I have always been kind of confused by the diversity of plants in this genus and by their very picky cultural needs. Since I have never spent the time required to really study which ones grow where, I have been missing out on this great plant. I spent some serious time researching the six species that are native to Tennessee and thought it would be fun to share the chart that I developed to help me select the right plants for my yard. To start out, it is good to be aware that all the species have several things in common. They are beautiful and easy to grow if you meet their needs. They all need full sun to reach their potential. Well-drained soil is a must. You can start from seed fairly easily but generally plants are slow to establish, so you are better off buying plants. The tall varieties are likely to need staking. That said, here is my chart, and please be sure to post any observations or edits you have. Native Plants I Wish I Hadn’t Planted! I always like to diversify my native plants as much as possible, and even though I try to research each species ahead of time, some of them always come back to bite me. Here is my list of regrets. If anyone has had a different experience with these plants or has found a way to deal with them, please post a response. Also to help out the rest of us, please consider posting your own list. 1. Virginia Wild Rye (Elymus virginicus). I can’t find a single good thing to say about this plant except that it is a cheap and very easy-to-grow grass. 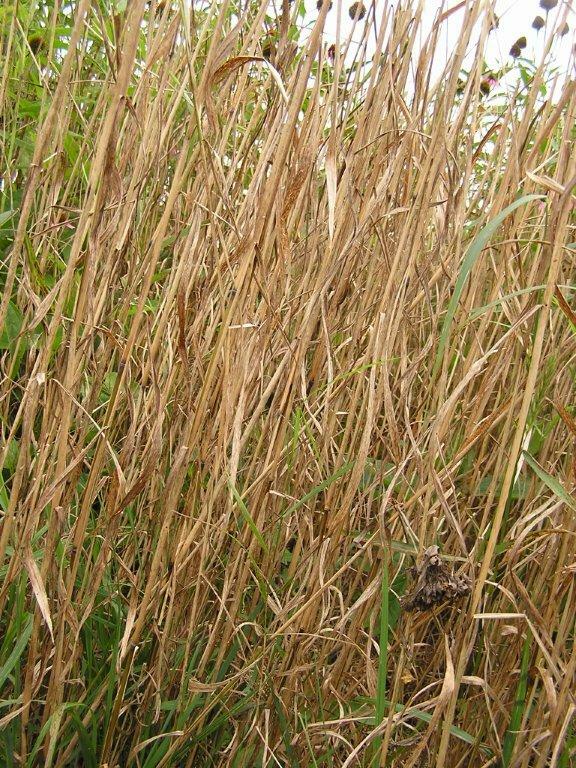 Since it is a cool season grass, it dries to a crispy brown in Tennessee’s summer heat and looks like a farmer’s field ready for harvest. It can’t stand up by itself in a storm and takes everything around it down with it when it goes. It is listed as “short-lived” but that is inaccurate. I have been pulling and dead-heading it for five years. 2. Big Bluestem (Andropogon gerardii). Generally, this is considered a very desirable meadow grass. Tall at 6-7’, it is sturdy and generally stands straight even after a storm. But it RE-SEEDS to the point of taking over and driving out everything else in just about 3 years. I complained to my seed source, but I don’t think they believed me, saying only that they had never heard of such a thing. I did buy my seeds from a northern state, so maybe I got a northern “ecotype” of the plant that just goes nuts in Tennessee’s warm climate. What are other people’s experiences with this plant and where did you get your seed? 3. Wild Strawberry (Fragaria virginiana). Although it is a charming, attractive groundcover, its ability to spread puts Bermuda grass to shame, especially if planted in sun. It works fairly well in dry shade, but it is almost like something from outer space if put in full sun with plenty of water. It is often on rain garden plant lists, and I made the mistake of using it in my rain garden. In less than 3 months, a total of 6 plants had buried every other plant in the garden, and when I pulled it all out, I had rooted plants about every inch to half inch. 4. Wild Petunia (Ruellia humilis). This plant is a darling, small purple petunia that makes a great groundcover. I read that it shoots its seed up to 10 feet through the air, which at the time sounded rather charming. In reality, it is a huge headache if you have any areas within 10-15 feet where you don’t want it or if it is planted among less aggressive plants. Since it blooms the first year from seed, those plants will then send their seed out another 10 feet..…kind of an exponential explosion. Even though it is a small plant, you cannot hand pull it by the roots . I am no longer sure that I want it, but it is too late. Once planted, it is so invasive that it is here to stay. 5. Sweet Black-Eyed Susan (Rudbeckia subtomentosa). This plant is both pretty and a huge headache. It is a great rain garden plant with bright yellow flowers. However, it is a giant plant at 5-6’ that sprawls in all directions by mid-summer, burying everything around it. It re-seeds with abandon, popping up everywhere in the yard. If you don’t have too many, the only solution is to cut it back to at least half its height in early June, which turns it into a somewhat manageable bush by the time it blooms in late July. I have spent 19 years growing native plants in my yard, a little over 5 years of which has been in northeast Tennessee. So I thought it would be fun to post a list of my favorite plant species in case they will be helpful to someone else. My favorites are those plants that are dependable, good on a modest budget, and easy to grow from seed applied on bare ground. They give me quick results that make me feel like I know what I am doing and that I don’t look back on with regret, thinking I should have known better. As a preface to the list, I should mention that I like to grow natives in a meadow-like setting as a replacement for lawn. So I am not necessarily recommending these plants for use in a groomed, formal flower bed, which is a whole different creature. I like to do larger areas from seed for a natural setting that draws lots of birds, butterflies and bees. 1. Purple Coneflower (Echinacea purpurea). This is my top pick. It is spectacular en masse, blooms for a long period, reseeds well on its own, and beloved by butterflies. It is also a favorite food of goldfinches, who are so impatient to eat that they start checking for seed ripeness as soon as flowers appear. When fall arrives, a flock of goldfinches hangs out in my yard for about two weeks while they stuff themselves. The seed is also inexpensive. You can get it for $2 an ounce (6,600 seeds). 2. Smooth Penstemon/ Foxglove Beardtongue (Penstemon digitalis). This is a charming, white flower that is a very strong re-seeder so you need to be a bit careful in the amount of seed you use. For such a tiny seed (130,000 per ounce), it has an amazingly successful germination rate. You can depend on it to quickly cover bare ground (perhaps a little too quickly). But again it is spectacular en masse, and a large, mass bloom comes alive with the hum of hundreds of bees. It is also an inexpensive seed at only $5 per ounce. 3. Lanceleaf Coreopsis (Coreopsis lanceolata). This is an easy coreopsis from seed and gives quick bloom in the first year. I like its bright dependable color. It makes a good nurse crop while other plants are getting started. I find it does tend to decline after a few years. 4. 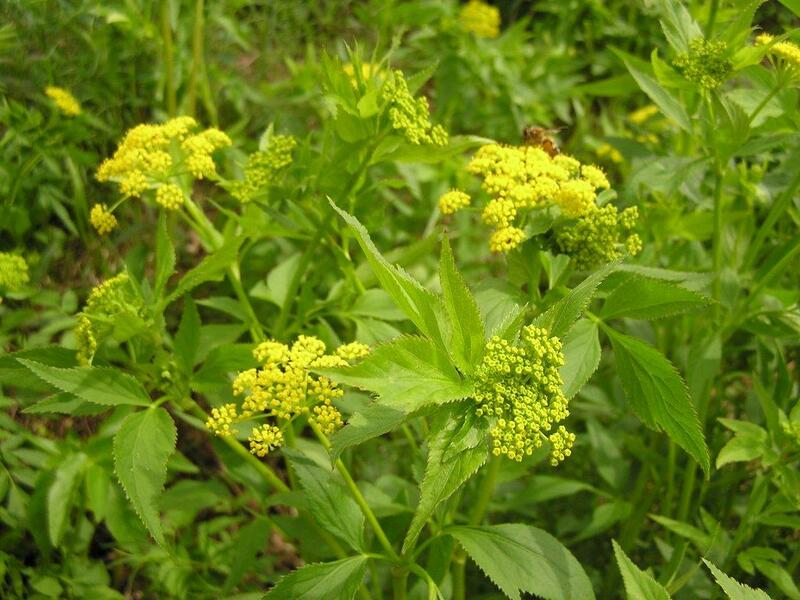 Golden Alexanders (Zizia aurea). This is a dependable, bright yellow flower for spring. Seed has a high germination rate, and plants re-seed readily so it is easy to get too much of it. However, it is a favorite food of swallowtail caterpillars, so I don’t mind if I have a solid field of it in April and May. (Even though prolific, it doesn’t seem to crowd out other plants.) Seed is only $5 per ounce (11,000 seeds), but be careful how much you use. 5. 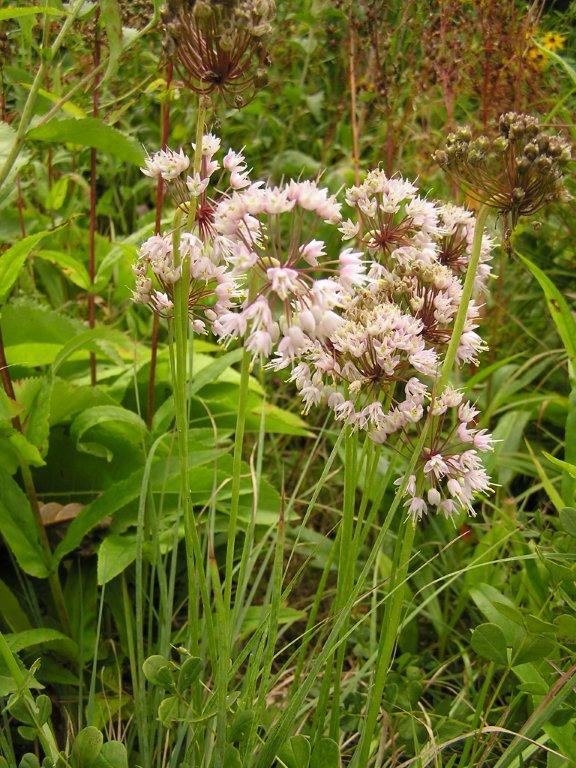 Nodding Pink Onion (Allium cernuum). Personally I love the cute nodding heads of pink flowers. Its dainty height and shape is a nice contrast to the large plant species. Given its small size, it is better placed along the garden edges. 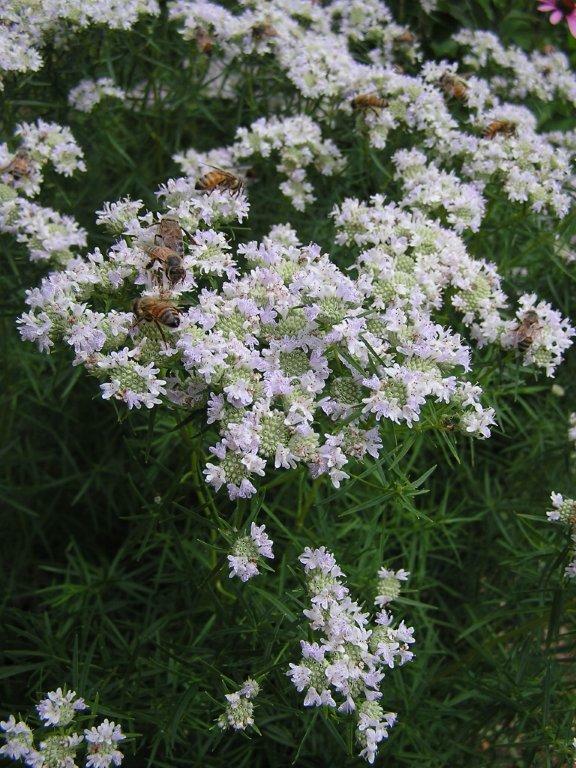 This is another bee plant, and as far as the bees are concerned, you can’t have too much. It is more expensive at $10 per ounce (7,600 seeds) but you can buy a ¼ oz. and depend on just a few plants to nicely reseed themselves over time. 6. Wild Bergamot (Monarda fistulosa). This plant is the old-fashioned native from which many cultivars have been produced. Unfortunately it has a bad, and in my opinion undeserved, reputation for mildew. I find the bees like it better than the cultivars, and the flowers are unique and beautiful. It is a little on the coarse side, but I wouldn’t be without it. When you plant the seed, be forewarned that it will feel like every single seed that you planted germinated. $10 per ounce (70,000 seeds), which is definitely an amount I do not recommend, so simply adjust the amount according to your needs. 7. Bradbury’s Monarda (Monarda bradburiana). If Wild Bergamot is too coarse for you, this is a tamer and smaller species that is easy from seed and spreads well. It has lovely flowers and deep green leaves. The bees and butterflies like it too. Very expensive seed at $50 per ounce (35,000 seeds), but you only need a small fraction of an ounce and some patience. 8. Slender Mountain Mint (Pycnanthemum tenuifolium). 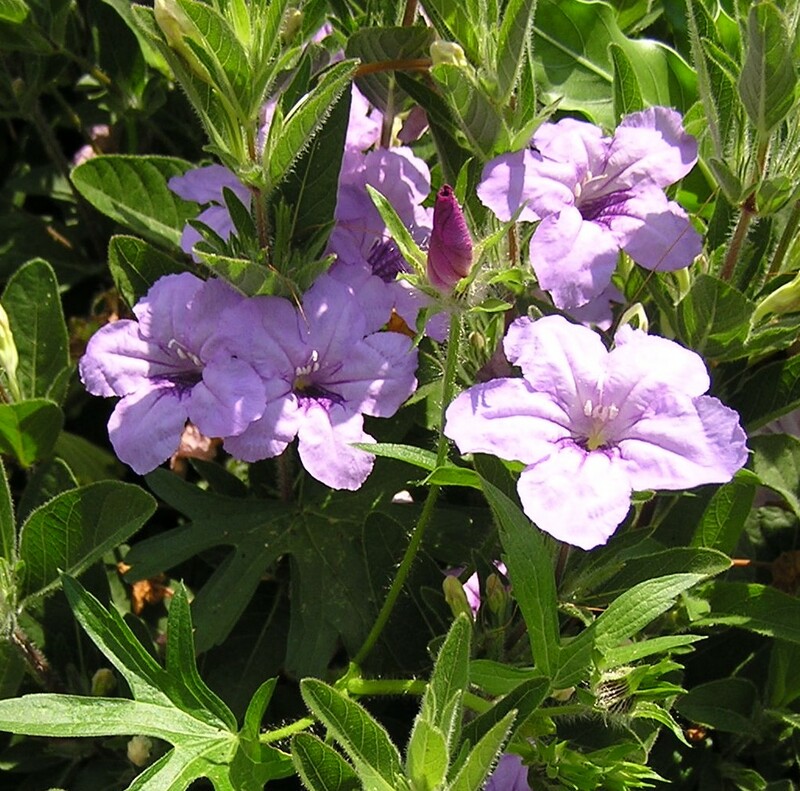 This is a mid-summer bloomer with many, small white flowers with purple-tinted edges. It is not a spectacular flower from a distance but extremely pretty close-up. It is very easy from seed, re-seeds readily, and very popular with butterflies and bees. It will provide a mass bloom just after the Alexanders have finished. Expensive seed at $30 per ounce (378,000 seeds), but you are better off with a fraction of an ounce. 9. Side-oats Gramma (Bouteloua curtipendula). This is a charming 2 foot tall grass that I have been told is a not a strong survivor in Tennessee. Granted it will never replace Little Bluestem as a “backbone” grass species for a meadow garden, but I love the ease of growth, the cute teeny red flowers that line the grass stalks, and its simple charm. So far mine are hanging in there for their 3rd succeeding year. Cheap seed at only $2 an ounce (6,000 seeds). 10. Blue Lobelia (Lobelia siphilitica). This is my “surprise plant.” It has very small seeds, at 500,000 per ounce. I have planted seed off and on over several years with very modest results. But it only takes a few plants, and once you have them, Blue Lobelia will move quickly into the areas that it likes. Although the books specify that it tends to be a wetland plant and likes wet to average moisture, it has planted itself on the steep, rather dry slope behind my garage. When things are turning brown and straggly in the fall, the bright blue of this lobelia is most welcome. After about 3 years, I have it scattered here and there across the entire slope. When I went back and looked at my original seed mix for this site, I found that it didn’t even contain Blue Lobelia. Although the seed is more expensive, you can buy 1/4 oz for $8, which is 125,000 seeds. P.S. With all these quoted prices and amounts, I anticipate questions on where I buy my seed. I get it from Prairie Moon Nursery in Winona, Minnesota. While I am very happy with their quality and service, I am sure there are also other outlets with competitive prices. We are compiling a list of native plants in Tennessee with the help of Master Gardener Joy Stewart! This blog will serve as a TN native plant database with images and growing information as well as a place where you can come and provide feedback and ask questions about plants in your garden! 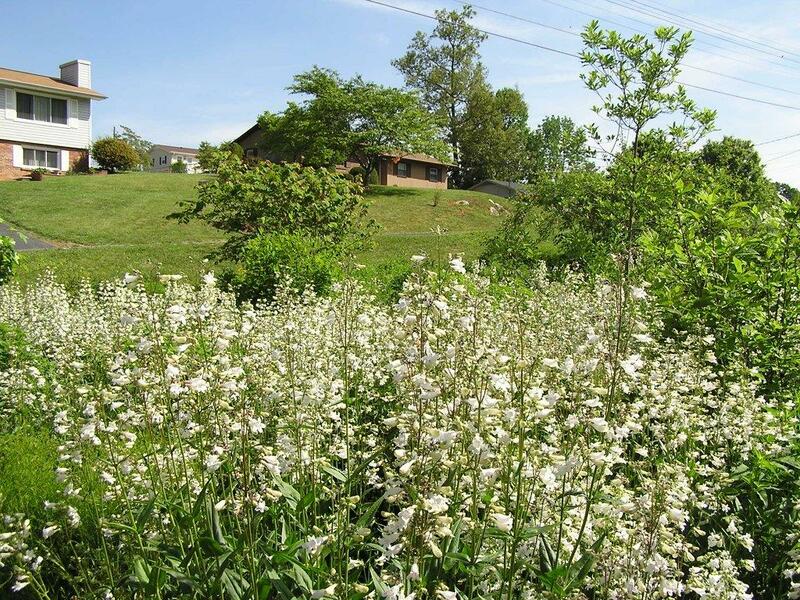 Tennessee Smart Yards is excited to provide a comprehensive listing of Tennessee native plants that are available commercially. We hope this site helps you select native plants for use in your yard. Feel free to comment and exchange information about these plants, such as your own experience or questions. If you have any pictures you would like to contribute to the collection please feel free to email us at tnyards@gmail.com.